Goats Like Field Trips Too! - Project: THRIVE! Well, we are well into the new year and 2018 is gearing up to be a busy one at the barn. If you want to be a part of the fun, there are lots of ways to get involved: SHARE our story with your friends and invite them to join us on this journey, DONATE to Project: Thrive or SPONSOR one of the animals that you feel a connection with, and/or VOLUNTEER with us. The animals especially would love to meet you and spend time getting to know you. Could 2018 be your year to cuddle with a cow? We sure hope so! Who says goats don’t make good scientists? 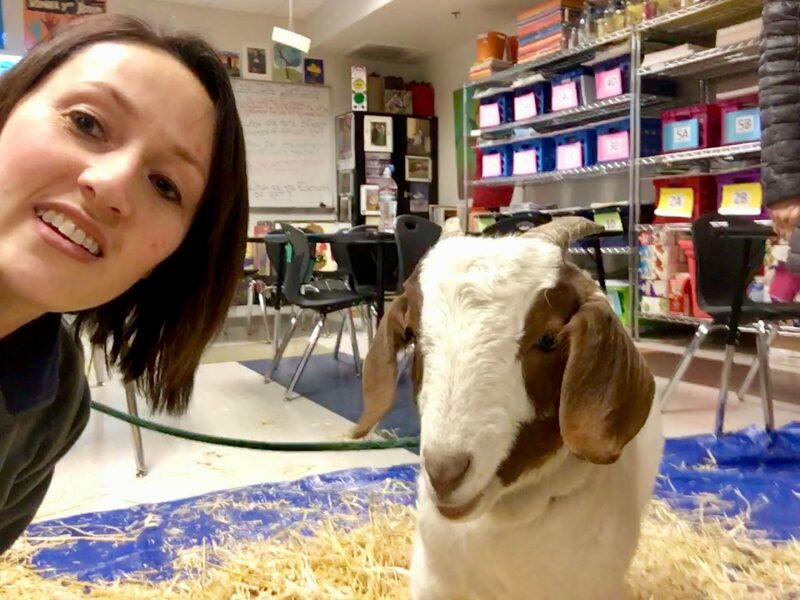 We took four of our goats (Harry, Willy, Jinx, and Hudson) to Science Night at our partnering school, Prospect Ridge Academy, to help the children learn more about the human-animal bond and to help all of the humans who were present know more about farm animals as individuals who are loving, playful, and supportive family members. 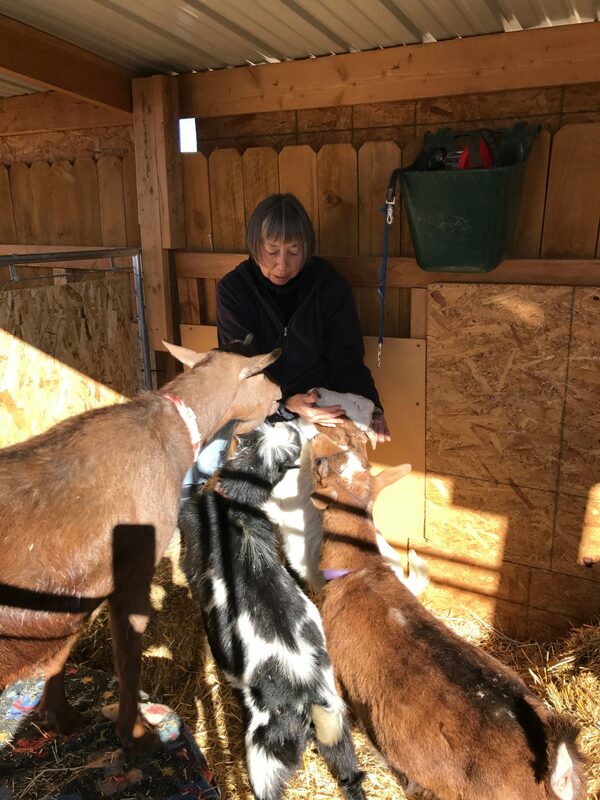 Many thanks to the volunteers who helped with goat care, Megumi, Lori, Julie, and Emily. 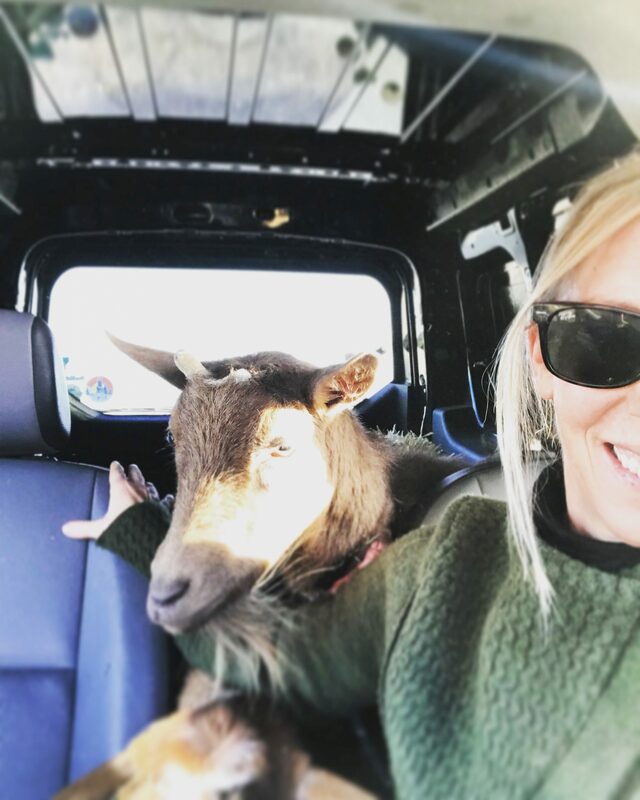 Also, big thanks to Emily for turning her van into a goat-mobile to safely transport the goats to and from the school. Everyone had a lot of fun and we are so thankful for the opportunity to have been a part of such a great event! The goats are feeling pretty special too. One of our fabulous volunteers, Eden Day, entered us in a friendly competition at Berkeley Untapped Brewery as a participant in their Benefiting Charities Event. Any patron ordering a drink gets a token to put into one of three charities donation box. At the end of the month Berkeley Untapped gives a donation based on the number of tokens the charity received in their donation box. (We are ahead by almost double after 2 weeks – happy dance!) We hope to have an event there at the end of February (they invited us to stay on the board for 2 months -more happy dancing) and 15 percent of all the sales during our event will also be donated to Project: Thrive. Now that is something to smile about! The event will be held on Saturday, Feb 24 from 4pm – 6pm, stay tuned for further details. Thank you, Eden and Berkeley Untapped! Sadly, we lost our sweet girl, Jenny recently. Jenny was our elderly chicken who came from the mountains. She passed quietly in her sleep after a wonderful day outside and a yummy dinner. She snuggled up into her warm bed area and went to sleep. In the morning she had already passed. 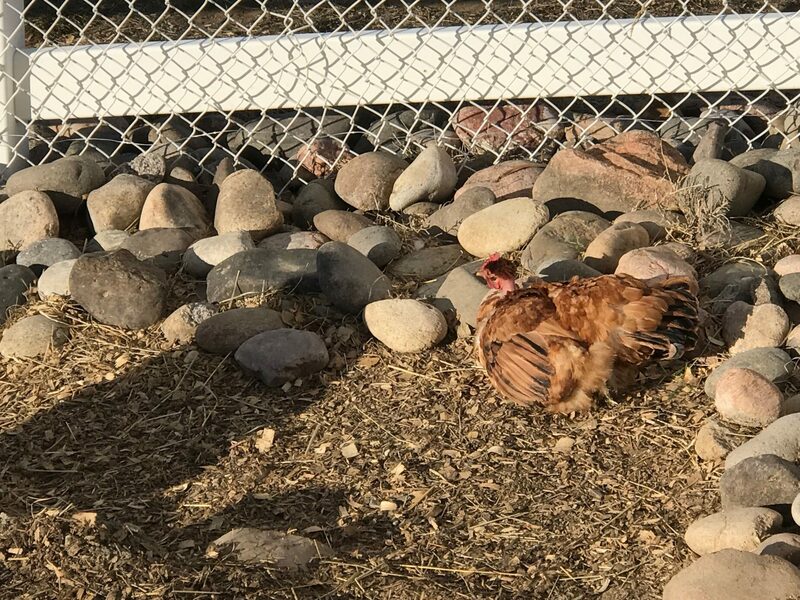 Jenny came to live happily ever after at Project: Thrive because the dad of Jenny’s former family threatened to open the coop door and put the chickens out in the forest to fend for themselves if they didn’t find another home for them. The chickens had stopped laying eggs so the dad didn’t want to keep them any longer. Luckily the mom of the family contacted us and we took Jenny, Mamie and Luna into our family. Jenny was a character and met Jinna, our founder, every morning and volunteer, Jenn, every evening to be the first to get a bite at mealtime. She made sure the ducks knew not to try and steal her food and she loved greeting visitors. Jenny was just great with kids. We all loved her sweet and independent spirit and she is surely missed by the humans and chickens who loved her so. Rest peacefully, sweet girl, you were loved and adored. Calling all Volunteers!! We need help finishing the permanent chicken/ duck/ Beatrix the Bunny coop!!! We are hosting Denver DaVita Dialysis and CSU Pre-Vet Club on Saturday, Feb 10 starting at 10:00 AM. Everyone is welcome and light refreshments along with lots of laughs with be served. We are in need of some of our regular volunteers to help introduce animals and lead some of the coop projects. For more information or to sign up to help out, please go HERE. That is all for now. We hope to see you soon!